The Story Of Amazing Peanut-A Turtle Who Was Deformed By our Litter. The Depressing image below is of Peanut, a red eared slider turtle, a real warrior! 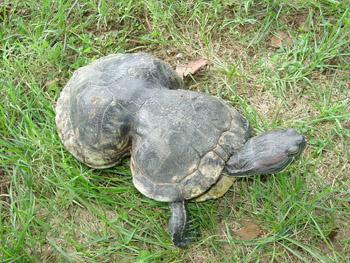 Peanut, an extraordinary turtle was found in Missouri in 1993. Peanut could easily be a prey to many animals or she could have drowned in the water but as luck would have it she was rescued and taken to a zoo in St. Louis where the six-pack ring on her body was removed. Missouri Department of Conservation is now responsible for her care now. There are multitudes of hazards waiting to trap animals! If an item has any loops or openings it isn’t difficult for an animal to get ensnared. The trapped animal often panics, making things worse. Since animals don’t have the same agility like people do, it’s difficult for them to get out of entanglements. Fishing line is another significant threat, especially since it’s often obscure. Snared animals do not usually survive long; they either starve or are quickly eaten by predators. Small plastic bits and cigarette filters also pose a significant threat. Animals usually can’t tell the difference between litter and food, so they eat the litter, and choke or fill their bellies with plastic and starve. Previous article NASA Will Pay You $5000 Per Month For Laying In Bed!! Next article Most Badass Elderly Couple Ever Lives In China. NASA Will Pay You $5000 Per Month For Laying In Bed!! Most Badass Elderly Couple Ever Lives In China.